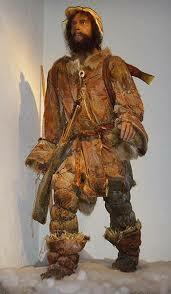 Ötzi (not his real name) lived on the Italian/Austrian border 3,300 years ago near the crest of the Ötzal Alps. He was 45, plus or minus 6 years and had a 3mm gap between his two upper front, teeth a condition which Madonna, Elton John, Lauren Hutton and Alfred E. Neuman also have, called diastema. Investigators know a lot about his murder, the coldest of cold cases, since he was on (well, in,) ice until 1991, when global warming thawed him and he was discovered by two hikers.